Even with diligent care which includes brushing, flossing, and regular dental visits, sometimes your teeth can still experience damage. Chipping or fracturing a tooth is one of the most common accidents that can happen—and it can happen at any age to any person. Chips and cracks often occur when you fall down, bite something hard or brittle, or grind your teeth during sleep. 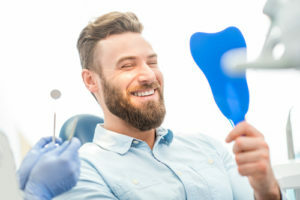 Fortunately, there are several options to fix a chipped tooth and repair your smile with no sign anything happened at all. Porcelain Veneers: A porcelain veneer can be placed on top of a chipped or cracked tooth to strengthen it and repair the aesthetics. Porcelain veneers are strong, long-lasting, and offer a natural-looking result that’s often imperceptible from your other teeth. CEREC® Same-Day Dental Crowns and Restorations: If a tooth is more significantly cracked or fractured, a CEREC dental crown may be recommended. We use state-of-the-art CAD-CAM technology to provide beautiful results in less time. Cosmetic Bonding: A small chip or crack may be fixed with cosmetic bonding. Cosmetic bonding disguises the damage, strengthens the tooth, and provides a fix that can last several years. A chipped tooth is no reason to lose confidence. We can help you correct this common issue while preserving the health and beauty of your smile. Talk to us today to learn more.